On June 23, 2014, three Al-Jazeera English journalists were convicted of terrorism in Egypt, as a result of their reporting. Canadian-Egyptian Mohamed Fahmy and Australian Peter Greste were sentenced to seven years in prison, while their Egyptian colleague Baher Mohamed has been sentenced to an additional three years for possession of ammunition. CJFE has released a statement, and you can find suggestions below on how to take action. 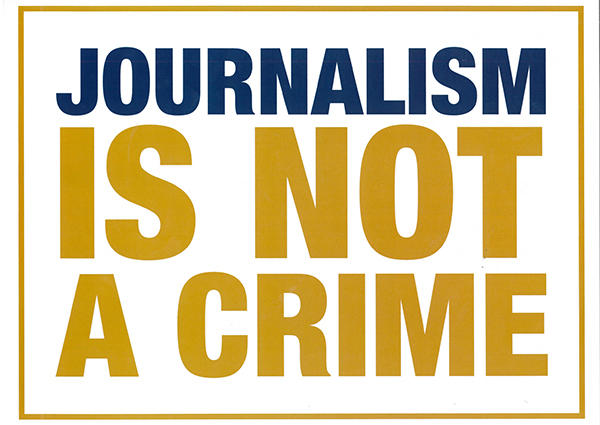 On December 29, 2013, three Al-Jazeera English journalists were arrested while working in Egypt. Mohamed Fahmy, Peter Greste and Baher Mohamed have been charged with spreading false news, aiding or belonging to a terrorist organization and operating without a permit. Al Jazeera denies all of the charges against its journalists, and has been working closely with CJFE to advocate for their release. Write a letter to Prime Minister Stephen Harper, Minister of Foreign Affairs John Baird and Minister of State (Foreign Affairs and Consular) Lynne Yelich, encouraging them to call on President al-Sisi to pardon the three journalists. Lend your support to the campaign to #FreeAJStaff and be sure to use the hashtag #FreeAJStaff when sharing the campaign. If you haven’t already, please sign the petition to free Fahmy, Greste and Mohamed. Having trouble viewing the timeline below? Click here.